Nobody, not even its director, ever dared to dream that a film set in a galaxy far, far away would not only change the lives of millions, but would also change the way people thought about, and of, film, Science Fiction and the world itself. Star Wars is without a doubt the most famous cultural phenomenon of the last half century and while other franchises and Universes have fallen by the wayside, the story of a mighty Empire, a valiant Rebellion and countless incredible worlds continues to grow in popularity and it’s mythos and canon continue to expand at an exponential rate. One of the many fan-based, and one of the only Lucasfilm and Disney sanctioned, endeavours to have emerged from the Star Wars Universe is Vader’s Fist, the 501st Legion, a global community of like-minded fans and souls determined to use their love of, and for, Star Wars in a positive way by bringing joy into their own lives, and those of countless others, and helping and benefiting those less fortunate than themselves. Originally formed by Albin Johnson, the 501st are a group of costumers and reenactors whose mission statement is a simple one, but one that they adhere to like glue. They are ‘bad guys doing good’, who put their own lives on hold in order to visit sick and terminally ill children in hospitals all over the world, to make the last wishes of people who won’t see too many more sunsets come true, to raise funds for various charities the world over and to bring a smile to the faces of hundreds of thousands of fans at conventions and events everywhere. They do it without hesitation and put their entire beings into everything that they do because of their love for Star Wars and because each and every one of them wants to make the world, if only for a brief moment in time, a little better and brighter for others. They are the unsung heroes of communities near and far who give that most precious of all commodities, their time, with no expectation of, or desire for, reward or recognition. They are your friends and neighbours. They are the 501st. And they are the Heroes of the Empire. 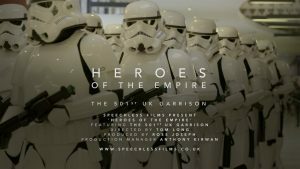 Directed by Tom Long, Heroes of the Empire sets out to do the near impossible, telling the epic tale of the 501st UK Garrison in an hour. It’s a story of passion, craft, precision, real life theatre and of the reason and rationale that most people cling to like a life buoy being subsumed by the desire to be a part of something bigger and better that inspires others while bringing a little light, via the power of the Dark Side, into the lives of others. It’s an incredibly intimate and personal story that lets its narrative unfold by allowing members of the UK Garrison, like it’s commanding officer, Gary Hailes, SL-24612 (Ian Wilson), SL-3683 (Rob Deneham) and Garrison Event Co-Ordinator Elaine Smith, to tell their stories of how and why they become involved with. and a part of, the 501st, what being a part of the Legion has given them and what being a member involves and entails. 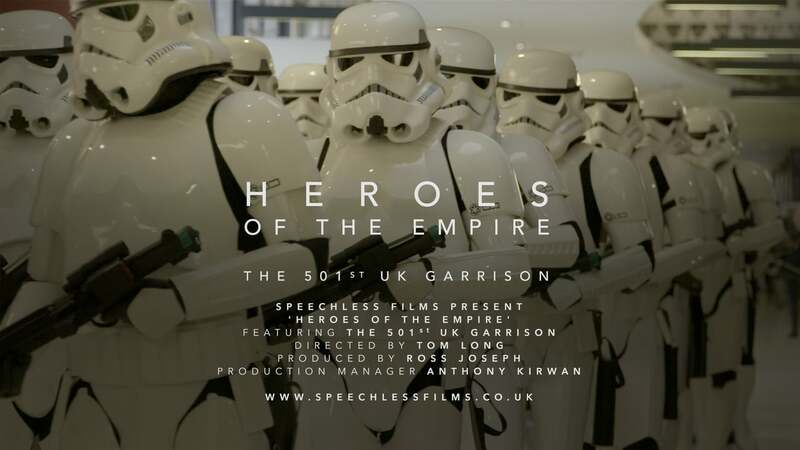 It’s a story of commitment, dedication that examines what it takes to be part of the 501st’s UK Garrison, of the standards expected and the comradeship and friendships that are formed within the unit; and from beginning to end, it is thoroughly compulsive viewing.